Yorkies are the cutest animals on earth! Raise your hand if you agree with that statement. The only challenge, however, is that these tiny doggies easily look neglected if denied routine grooming. And since hiring a professional groomer has become quite expensive of late, you’re better off doing it yourself. That’s why investing in the best dog clippers for Yorkie is such a good idea. If you love your doggie, you’d certainly want nothing but the best for them. Since a fur cut is a basic part of your furry friend’s beauty, why not get them one of these 10 top clippers? Read on. Ranked as one of the best clippers for Yorkies under $50, the U-Clip offers a great deal of power. This is attributed to its electromagnetic motor that keeps working without overheating. What’s more? The U-Clip has the reputation of cutting its way through dog hair the same way a hot knife does through butter. Of course, its 7200 SPM motor is to thank for that. Moving on, this unit operates generally quietly. That’s a big plus for anyone who might be dealing with a stubborn dog. On top of that, the machine comes with a 16-piece kit which presents you with all the accessories you may need. This way, you can embark on any trimming process without looking back. Wondering if this one is capable of giving you the right deal? Well, the good news is that the U-Clip is backed by a 30-day money back guarantee period. That’s in addition to a 2-year limited warranty. Convenient storage and carrying case. Struggles when used on extremely dirty dogs. Not all Yorkies are calm. Sometimes, you might find yourself dealing with an overly aggressive one. For that reason, it’s always a good idea to go for a powerful clipper. The Andis ProClip is what, in our view, fits that exact description. First off, it comes with a tough and resilient body. Its housing is made from high-quality material meaning it can still operate even after an accidental fall. Above all, this machine boasts a 2-speed setting. Ordinarily, you can take care of most pet shaving needs with Speed #1. However, if faced with an uphill task, you can always turn to Speed #2 for additional power. Another plus with this clipper is that it runs cool even after long hours of use. That said, it may get slightly warm (although not uncomfortably so). Also, keep in mind that it’s a bit noisy and, therefore, might prove a bit difficult to use on a scared dog. May overheat if you don’t apply the lubricant. PetTech isn’t really a household brand when it comes to the production of blade clippers. However, this particular model from them seems like a good deal. To begin with, it’s cordless and that means you can use it freely without being limited to a cord’s length. Secondly, it comes with a super-quiet motor. So, indeed, this is one of the quietest clippers for dogs that we’ve encountered so far. On the flipside, though, it’s not that powerful. We’d recommend it for simple touch-ups. However, if you’re dealing with an unkempt pooch, this might struggle. What’s more, it also tends to overheat easily. You can’t use it for 40 minutes without the need to let it cool down. Other than that, it has a relatively powerful battery. Also, its blade is quite convenient to use since it doesn’t pull your pet’s delicate hair. For added durability, the PetTech comes with precision-cut titanium blades. These are rust-resistant in addition to being remarkably powerful. This 5-in-1 bade is renowned for its versatility. Indeed, it gives you the freedom to choose from #9, 10, 15, 30, and 40 varieties. That gives you the power to choose the best cutting length for each situation. On top of that, the Bravura comes with a superb battery. This provides you with a 90-minute run-time. How long does it take to recharge? You might want to ask. Well, this battery takes a paltry 60 minutes to recharge. That’s quite reasonable although we’d recommend recharging it ahead of time. Otherwise, if you’re shaving a larger animal, we’d recommend getting a spare battery. As far as trimming power is concerned, this machine doesn’t disappoint. It cuts smoothly, especially when exposed to the fur of a clean Yorkie. However, there’s one downside to it. It tends to vibrate strongly when clogged up. We’d, therefore, recommend taking brief breaks after every 10 minutes. Otherwise, this is a great tool for sculpting. Works perfectly for small animals. Doesn’t easily get bogged down. Although the battery is good, you may need to get a new one after a year or use (or so). One thing we like about this corded trimmer is that it has a powerful, shatter-proof body. This is just the kind you need for long-term performance. For added cutting efficiency, this unit boasts a wide blade which comes in handy in ensuring fast trimming. As far as speed is concerned, this is a 2-speed machine. You can always start with Speed #1 which is 3,000 SPM. That’s just as much as you’ll need for basic trimming. Looking to trim faster? Well, you’ll only need to shift to the 4,000 SPM speed. So, in other words, this unit arms you with all the flexibility you need to sweep through fur with ease. The key highlight of this trimmer is that it comes with a #10 CryogenX blade which does a remarkable job. That said, we’d like to criticize the Oster A5 for its tendency to overheat. However, that might only be an issue if dealing with a big dog. For instance, a typical German Shepherd dog requires at least 40 minutes to shave. That might be too long for this. Fortunately, Yorkies aren’t that large. That means you can get the job done in just under 20 minutes before the Oster becomes unbearably hot. It tends to heat up easily. Some users have complained about it shaking. Recommended for fine to medium trimming, this machine offers good value for money. So, whether you want to use it for touchups or complete grooming, you can always bank on it. But how are its specs? To begin with, it comes with self-sharpening blades. These are made from high-carbon steel which also makes them long-lasting. The fact that the blades are self-sharpening eliminates the need for sharpening or replacing them regularly. That, also, represents good value for money. As far as ergonomics are concerned, we find this unit quite handy. Its exterior is made from a non-grip housing. This is easy to handle and it gives you the freedom to cut at different angles. Faced with thick fur? Well, you’ll be glad to learn that the Pro Series comes with a PowerDrive motor which is pretty powerful. However, we would like to point out that this unit gives you limited blade options. On top of that, it also tends to get crazy hot if used for more than 30 minutes, straight. Can manage huge knots of fur. Limits you on blade variety. The blade gets too hot, prematurely. If you’re dealing with a docile Yorkie, this might be the right dog clipper to go for. Its exterior looks a bit cheap, though. We certainly wouldn’t recommend it for horse trimming. That said, we’d vouch for it as far as the shaving of small dogs and cats is concerned. One of the unique selling points of this machine is that it’s cordless. Being cordless means you can use it for touchups. On top of that, you can have more fun with your dog using this. That would not be the case with a corded trimmer as it’d limit you to the length of the cord. On top of that, the ARCO comes with a 5-in-1 set of blades. You simply need to pick the length that works best for you. Multiple blades to choose from. Great for trimming and touchups. This machine is a monster in terms of battery power. Take this for example; it comes with a battery that lasts for 7 hours when in use. That is well above average given the fact that most clippers barely deliver 100 minutes of run time. Besides that, this clipper offers 9,000 revolutions per minute. That’s just enough to deal with any hairy animal. This clipper boasts ultra-quiet technology. Indeed, it operates at below 60dB which may not disturb your pet. This quietness can be attributed to the fact that it uses a built-in silencer technology. Unfortunately, that’s where the good story ends. Many people have complained that this clipper isn’t as powerful or rugged as it seems. We also think that the clipper is pretty slow. So, you need to be patient when using it especially if you’ve used other faster clipper models. Not ideal for extremely long hair. We didn’t like its guards. 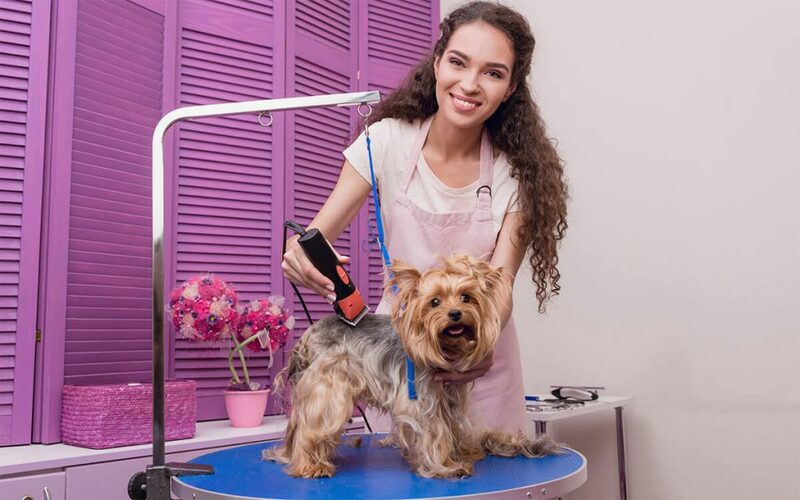 If your Yorkie is afraid of the whirling noise caused by dog clippers, then perhaps this Oneisall Clipper is what you need. It boasts an ultra-quiet and low vibration design so that your pet feels at ease. As if that’s not enough, the clipper is equipped with four-guard combs of different lengths. Similarly, it comes with detachable guide combs to allow for easy and quick comb changes. What’s more? The clipper employs a stainless steel blade that is ideal for long-term use. This is also detachable for ease of changing and cleaning. And here's the best part; it is powered by a rechargeable Lithium-ion battery to ensure exceptional flexibility. You can also use the clipper while charging for added convenience. Works continuously for two hours on a full charge. Durable stainless steel comb and scissors. Clips hair of different lengths with ease. Safe and extremely sharp blade. It is not high-powered enough. Made in the USA, this dog clipper for Yorkie claims to have everything you might need for trimming small or large dogs. To start with, it is fitted with self-sharpening and precision blades. The blades are made of high carbon steel for long-lasting performance. On top of that, it utilizes a powerful PowerDrive motor. For that reason, the clipper easily cuts through thick fur. What is more, the clipper has incredible fur feeding power. That's the dependability needed to prevent clogging. Also included with the purchase are guide combs to help you achieve the desired coat length. A blade guard, mirror, and styling comb are also included. Ergonomically made for ease of use. Comes with scissors, storage case, cleaning brush and oil. While it’s tempting to go for the cheapest clippers available, we’d recommend exercising a bit of caution. Why so? A cheap clipper might disappoint you when its blades become blunt prematurely. Also, it may not have the power you need to get through your Yorkie's coat. Also, it may be prone to overheating and, therefore, expose your lovely dog to the risk of burns. With all that said, here are the 4 main factors to consider when buying clippers. Cutting power: Go for a unit that delivers at least 3,000 strokes per second. Comfort: Look for an ergonomically designed model. Overheating: Your best bet is a clipper that can be operated for over 40-minutes with no major qualms. Cord: Corded clippers are quite powerful and reliable but they tend to limit you in terms of movement. Cordless clippers offer you greater freedom though they may offer you a limited supply of power. Charging time: This is a huge factor to consider when going for cordless clippers. The shorter the charging time, the better. Likewise, the longer the run-time, the better. Looking at all those factors mentioned in the buying guide above, we think the Wahl U-Clip Deluxe Pet Clipper deserves the overall title. It is powerful, reliable, and above all well-built. It also has sustained an incredible track-record and amassed loads of positive reviews. Therefore, if you’re still not sure where to put your money, we’d confidently recommend giving it a shot. No matter what brand of dog clippers you choose, they all have their fair share of strengths and weaknesses. That should not, however, discourage you from getting one for yourself. After all, there are no perfect products in this world. So, we’d advise you to identify one good clipper and stick to it. Luckily our editors have provided you with all the information you need to get good value for money.